Vietnamese Prime Minister Nguyen Xuan Phuc meeting with Chinese President Xi Jinping at the Great Hall of the People, Beijing, Sept. 13, 2016 (Lintao Zhang by photo via AP). 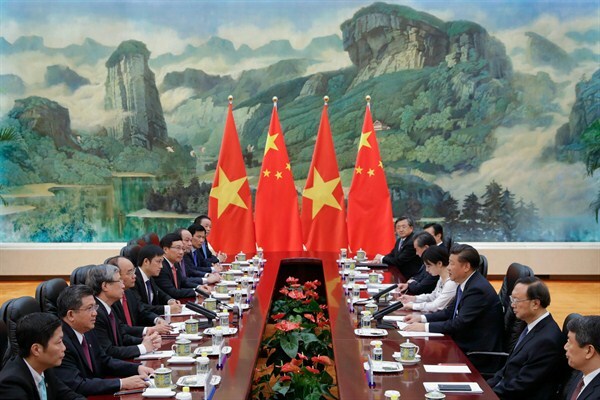 Vietnam’s prime minister, Nguyen Xuan Phuc, concluded a six-day state visit to China last week that included meetings with President Xi Jinping, Premier Li Keqiang and top legislator Zhang Dejiang. Phuc also attended the China-ASEAN Expo and China-ASEAN Business and Investment Summit in Nanning and made a business-focused visit to Hong Kong. But the trip’s primary focus was deepening economic and people-to-people ties, which have been strained in recent years by spillover from China and Vietnam’s disputes in the South China Sea.